By stretching the amount of time proteins can be simulated in their natural state of wiggling and gyrating, a team of researchers at Colorado State University has identified a critical protein structure that could serve as a molecular Achilles heel able to inhibit the replication of dengue virus and potentially other flaviviruses such as West Nile and Zika virus. As described in the current edition of PLOS Computational Biology, the simulations home in on a small segment of a viral enzyme called non-structural protein 3 (NS3), that plays a critical role in replicating the dengue RNA genome, which the virus requires to survive and spread. Over the past couple of decades, researchers around the world have considered NS3 a primary target for developing drugs capable of inhibiting and preventing the replication of the dengue virus. But many worry that since NS3’s protein sequence has similarities to related human proteins, drugs capable of inhibiting this enzyme might create unwanted side effects, even affecting a cell’s natural antiviral response. For this reason, researchers have been trying to further clarify how this viral enzyme works on a molecular scale. The new study does just that through microsecond-long molecular dynamic simulations aided by the Comet supercomputer at the San Diego Supercomputer Center at UC San Diego and Bridges, based at the Pittsburgh Supercomputing Center. Both computing resources were provided by the National Science Foundation-funded Extreme Science and Engineering Discovery Environment (XSEDE) program, one of the most advanced collections of integrated digital resources and services in the world. Though microseconds (millionths of a second) sound extremely brief, the 12.5 microseconds of simulation reported in the current study is 100 times longer than previously reported simulations on dengue NS3. Dengue virus is transmitted by Aedes aegypti and other mosquitoes, with approximately 50 million serious infections worldwide each year, and 20,000 deaths. Severe dengue infection is currently the leading cause of childhood mortality in several Latin and Asian countries, with a growing number of locally acquired infections in Florida, Texas, and Hawaii. In the most severe cases, a flu-like illness develops, which may take a potentially fatal turn, especially in children. In addition to severe muscle and bone pain accompanied by high fever for days, a patient can develop internal bleeding and other debilitating symptoms. To date, there are no approved drugs that can stop the replication or spread of the virus. A vaccine is available, but only has been approved for use in 11 countries, not including the United States. Developing antivirals to treat dengue and related viral infections is no small task, and identifying targets that drugs can be developed against is critical. Three decades ago researchers identified NS3 as crucial to the virus’ survival. NS3 was determined to be a helicase, which is an enzyme that unwinds and crawls along double-stranded RNA, somewhat like a conveyor belt in a copy machine, feeding the viral RNA into another protein called NS5 for replication. “In essence, NS3 is the motor that feeds the template RNA into the copying machine (NS5),” McCullagh said. Previous studies have shown that when NS3 is mutated, the enzyme’s role in genome replication is curtailed and the virus cannot make copies of its genome, demonstrating NS3’s importance in the virus’ life cycle. Unfortunately, drugs already identified to inhibit NS3 suffer from specificity issues, at times mimicking the activity of other drugs that treat unrelated conditions and interacting with cellular proteins. For that reason, drug designers have been seeking so-called “allosteric binding sites” for selective therapeutics, which tend to be different between viral and human enzymes. Finding such binding sites had proved elusive, however, since NS3’s mechanics -- how it unpacks and moves along the RNA strand -- were poorly understood. Previous supercomputing simulations weren’t much help either, since the best timescales -- ranging only from tens to hundreds of nanoseconds (billionths of a second) – were too brief to precisely capture each step in the process. In the current study titled “Allostery in the dengue virus NS3 helicase: insights into the NTPase cycle from molecular simulations,” the research team was able to lengthen the simulations to microseconds, enough time to see something significant researchers hadn’t witnessed before. Advanced software and the rapid calculation speeds of both Comet and Bridges made the current simulations possible. In particular, the graphics processing units (GPUs) on Comet enabled the team to simulate the motion more efficiently than possible if they had used only the central processing units (CPUs) present on most supercomputers. As described in the paper, the extra simulation time revealed a previously unknown role played by motif V, a set of amino acid residues in NS3. 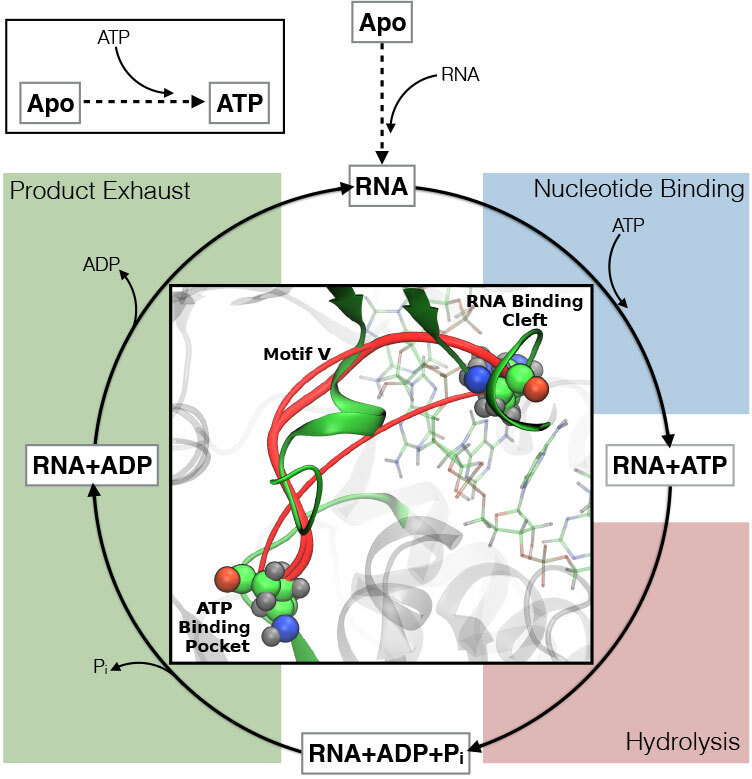 In one way, this protein segment may be described as a network of interconnected strings that transmits messages between the binding pocket of ATP and the RNA binding cleft, analogous to a tin can telephone. Messages, in the form of free energy, are relayed from one binding site to the other through motif V, leading to structural rearrangements of amino acids that enable the burning of ATP or the unwinding and translocation along RNA. In search of another analogy, McCullagh added: “In a way, you can think of NS3 as a car’s engine, where motif V is the crankshaft that converts energy released during the burning of gasoline, ultimately leading to rotation of the wheels. The binding and hydrolysis of ATP is hypothesized to shift the positions of motif V residues and, thus, convert chemical energy into mechanical energy. Other co-authors of this study are: Russell B. Davidson and Josie Hendrix, both from Colorado State University. Funding was provided by start-up funds to Martin McCullagh from Colorado State University.